Operation Banner was the operational name for the British Armed Forces‘ operation in Northern Ireland from August 1969 to July 2007. It was initially deployed at the request of the unionist government of Northern Ireland to support the Royal Ulster Constabulary (RUC). After the 1998 Belfast Agreement, the operation was gradually scaled down. Its role was to assert the authority of the government of the United Kingdom in Northern Ireland. At the peak of the operation in the 1970s, the British Army was deploying around 21,000 soldiers. By 1980, the figure had dropped to 11,000, with a lower presence of 9,000 in 1985. The total climbed again to 10,500 after the intensification of the IRA use of barrack busters toward the end of the 1980s. In 1992, there were 17,750 members of all British military forces taking part in the operation. The British Army build-up comprised three brigades under the command of a lieutenant-general. There were six resident battalions deployed for a period of two and a half years and four roulement battalions serving six-months tours. In July 1997, during the course of fierce riots in nationalist areas triggered by the Drumcree conflict, the total number of security forces in Northern Ireland increased to more than 30,000 (including the RUC). A British Army Ammunition Technical Officer approaches a suspect device in Belfast. The British military was responsible for about 10% of all deaths in the conflict. According to one study, the British military killed 306 people during Operation Banner, 156 (~51%) of whom were unarmed civilians. Another study says the British military killed 301 people, 160 (~53%) of whom were unarmed civilians. Of the civilians killed, 61 were children. Only four soldiers were convicted of murder while on duty in Northern Ireland. All were released after serving two or three years of life sentences and allowed to rejoin the Army. Senior Army officers privately lobbied successive Attorney Generals not to prosecute soldiers, and the Committee on the Administration of Justice says there is evidence soldiers were given some level of immunity from prosecution. Elements of the British Army also colluded with illegal loyalist paramilitaries responsible for numerous attacks on civilians (see below). Journalist Fintan O’Toole argues that “both militarily and ideologically, the Army was a player, not a referee”. 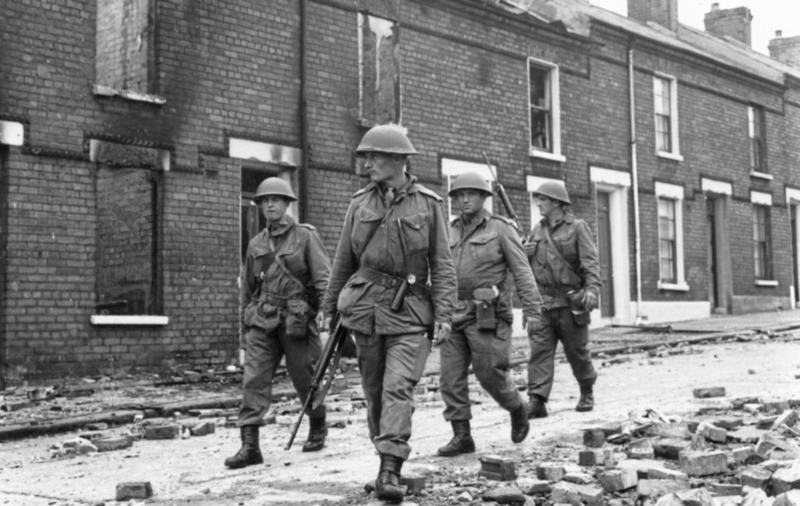 Many Catholics initially welcomed the British Army’s deployment, as Catholic neighbourhoods had been attacked by Protestant loyalists and the Royal Ulster Constabulary (RUC). However, relations soured between the British Army and Catholics. The British Army’s actions in support of the RUC and the unionist government “gradually earned it a reputation of bias” in favour of Protestants and unionists. In the British Army’s campaign against the IRA, Catholic areas were frequently subjected to house raids, checkpoints, patrols and curfews that Protestant areas avoided. There were frequent claims of soldiers physically and verbally abusing Catholics during these searches. In some neighbourhoods, clashes between Catholic residents and British troops became a regular occurrence. In April 1970, Ian Freeland — the British Army’s overall commander in Northern Ireland — announced that anyone throwing petrol bombs would be shot dead if they did not heed a warning from soldiers. The Falls Curfew in July 1970, was a major blow to relations between the British Army and Catholics. A weapons search in the mainly Catholic Falls area of Belfast developed into a riot and then gun battles with the IRA. The British Army then imposed a 36-hour curfew and arrested all journalists inside the curfew zone. It is claimed that, because the media were unable to watch them, the soldiers behaved “with reckless abandon”. A large amount of CS gas was fired into the area while hundreds of homes and businesses were forcibly searched for weapons. The searches caused much destruction and there were scores of complaints of soldiers hitting, threatening, insulting and humiliating residents. The Army also admitted there had been looting by some soldiers. Four civilians were killed by the British Army during the operation and another 60 suffered gunshot wounds. On 9 August 1971, internment (imprisonment without trial) was introduced in Northern Ireland. Soldiers launched dawn raids and interned almost 350 people suspected of IRA involvement. This sparked four days of violence in which 20 civilians were killed and thousands were forced to flee their homes. Seventeen civilians were killed by British soldiers, 11 of them in the Ballymurphy Massacre. No loyalists were included in the sweep and many of those arrested were Catholics with no provable paramilitary links. Many internees reported being beaten, verbally abused, threatened, denied sleep and starved. Some internees were taken to a secret interrogation centre for a program of “deep interrogation”. The interrogation techniques were described by the European Court of Human Rights as “inhuman and degrading”, and by the European Commission of Human Rights as “torture“. The operation led to mass protests and a sharp increase in violence over the following months. Internment lasted until December 1975 and during that time 1,981 people were interned. The incident that most damaged the relationship between the British Army and the Catholic community was “Bloody Sunday“, 30 January 1972. During an anti-internment march in Derry, 26 unarmed Catholic protesters and bystanders were shot by soldiers from the 1st Battalion, Parachute Regiment; fourteen died. Some were shot from behind or while trying to help the wounded. The Widgery Tribunal largely cleared the soldiers of blame, but it was regarded as a “whitewash” by the Catholic community. A second inquiry, the Saville Inquiry, concluded in 2010 that the killings were “unjustified and unjustifiable”. On 9 July 1972, British troops in Portadown used CS gas and rubber bullets to clear Catholics who were blocking an Orange Order march through their neighbourhood. The British Army then let the Orangemen march into the Catholic area escorted by at least 50 masked and uniformed Ulster Defence Association (UDA) militants. At the time, the UDA was a legal organization. That same day in Belfast, British snipers shot dead five Catholic civilians, including three children, in the Springhill Massacre. On the night of 3–4 February 1973, British Army snipers shot dead four unarmed men (one of whom was an IRA member) in the Catholic New Lodge area of Belfast. In the early hours of 31 July 1972, the British Army launched Operation Motorman to re-take Northern Ireland’s “no-go areas“. These were mostly Catholic neighbourhoods that had been barricaded by the residents to keep out the security forces and loyalists. During the operation, the British Army shot four people in Derry, killing a 15-year-old Catholic civilian and an unarmed IRA member. “We were not there to act like an army unit, we were there to act like a terror group”. At first, many of the drive-by shootings were blamed on Protestant loyalists. Republicans claim the MRF sought to draw the IRA into a sectarian conflict and divert it from its campaign against the state. The MRF was succeeded by the SRU, and later by the FRU. Over time, the British Army modified its tactics and curbed the worst excesses of its troops in crowd control situations, leading to a gradual reduction in civilian fatalities. By the 1990s, these were a rare occurrence. In May 1992, there were clashes between paratroopers and Catholic civilians in the town of Coalisland, triggered by a bomb attack which severed the legs of a paratrooper. The soldiers ransacked two pubs, damaged civilian cars and opened fire on a crowd. Three civilians were hospitalized with gunshot wounds. As a result, the Parachute Regiment was redeployed outside urban areas and the brigadier at 3 Infantry Brigade, Tom Longland, was relieved of his command. In their efforts to defeat the IRA, there were incidents of collusion between the British Army and loyalist paramilitaries throughout the conflict. This included soldiers taking part in loyalist attacks while off-duty, giving weapons or intelligence to loyalists, not taking action against them, and hindering police investigations. The Army also had double agents and informers within loyalist groups who organized attacks on the orders of, or with the knowledge of, their Army handlers. The De Silva report found that, during the 1980s, 85% of the intelligence that loyalists used to target people came from the security forces. A 2006 Irish Government report alleged that British soldiers also helped loyalists with attacks in the Republic of Ireland. The Army’s locally-recruited Ulster Defence Regiment (UDR) was almost wholly Protestant. Despite the vetting process, loyalist militants managed to enlist; mainly to obtain weapons, training and intelligence. A 1973 British Government document (uncovered in 2004), “Subversion in the UDR”, suggested that 5–15% of UDR soldiers then were members of loyalist paramilitaries. The report said the UDR was the main source of weapons for those groups,although by 1973 weapons losses had dropped significantly, partly due to stricter controls. By 1990, at least 197 UDR soldiers had been convicted of loyalist terrorist offences and other serious crimes including bombings, kidnappings and assaults. Nineteen were convicted of murder and 11 for manslaughter. This was only a small fraction of those who served in it, but the proportion was higher than in the regular British Army, the RUC and the civilian population. Initially, the Army allowed soldiers to be members of the Ulster Defence Association (UDA). Despite its involvement in terrorism, the UDA was not outlawed by the British Government until 1992. In July 1972, Harry Tuzo (the Army’s GOC in Northern Ireland) devised a strategy to defeat the IRA, which was backed by Michael Carver, head of the British Army. and suggested they “turn a blind eye to UDA arms when confined to their own areas”. That summer, the Army mounted some joint patrols with the UDA in Protestant areas, following talks between General Robert Ford and UDA leader Tommy Herron. In November 1972 the Army ordered that a soldier should be discharged if his sympathy for a paramilitary group affects his performance, loyalty or impartiality. Within three years, 171 soldiers with UDA links had been discharged. In 1977, the Army investigated a UDR battalion based at Girdwood Barracks, Belfast. The investigation found that 70 soldiers had links to the Ulster Volunteer Force (UVF), that thirty soldiers had fraudulently diverted up to £47,000 to the UVF, and that UVF members socialized with soldiers in their mess. Following this, two soldiers were dismissed on security grounds. The investigation was halted after a senior officer claimed it was harming morale. Details of it were uncovered in 2011. During the 1970s, the Glenanne gang—a secret alliance of loyalist militants, British soldiers and RUC officers—carried out a string of attacks against Catholics in an area of Northern Ireland known as the “murder triangle”. It also carried out some attacks in the Republic. Lethal Allies: British Collusion in Ireland claims the group killed about 120 people, almost all of whom were reportedly uninvolved Catholic civilians. The Cassel Report investigated 76 murders attributed to the group and found evidence that soldiers and policemen were involved in 74 of those. One member, RUC officer John Weir, claimed his superiors knew of the collusion but allowed it to continue. The Cassel Report also said some senior officers knew of the crimes but did nothing to prevent, investigate or punish. Attacks attributed to the group include the Dublin and Monaghan bombings (1974), the Miami Showband killings (1975) and the Reavey and O’Dowd killings (1976). The Stevens Inquiries found that elements of the British Army had used loyalists as “proxies”. Through their double-agents and informers, they helped loyalist groups to kill people, including civilians. It concluded that this had intensified and prolonged the conflict. The Inquiries found evidence only two lives were saved and that Nelson/FRU was responsible for at least 30 murders and many other attacks – many of them on civilians.One victim was solicitor Pat Finucane. Nelson also supervised the shipping of weapons to loyalists from South Africa in 1988. From 1992–94, loyalists were responsible for more deaths than republicans, partly due to FRU. Members of the security forces tried to obstruct the Stevens investigation. During the 38 year operation, 1,441 members of the British armed forces died in Operation Banner. This includes those who were killed in paramilitary attacks as well as those who died as a result of assault, accidents, suicide and natural causes. 692 soldiers in the regular British Army were killed as a result of paramilitary violence while another 689 died from other causes. 197 soldiers from the Ulster Defence Regiment were killed as a result of paramilitary violence while another 284 died from other causes. 7 soldiers from the Royal Irish Regiment were killed as a result of paramilitary violence while another 60 died from other causes. 9 soldiers from the Territorial Army were killed as a result of paramilitary violence while another 8 died from other causes. 2 members from other branches of the Army were killed as a result of paramilitary violence. 21 Royal Marines were killed as a result of paramilitary violence while another 5 died from other causes. 8 Royal Navy servicemen were killed as a result of paramilitary violence while another 3 died from other causes. 4 Royal Air Force servicemen were killed as a result of paramilitary violence while another 22 died from other causes. It was announced in July 2009 that their next of kin will be eligible to receive the Elizabeth Cross. According to the “Sutton Index of Deaths”, at the Conflict Archive on the Internet (CAIN), the British military killed 305 people during Operation Banner. Another detailed study, Lost Lives, states that the British military killed 301 people during Operation Banner. The operation was gradually scaled down since 1998, after the Good Friday Agreement, when patrols were suspended and several military barracks closed or dismantled, even before the beginning of IRA’s decommissioning. The process of demilitarisation started in 1994, after the first IRA ceasefire. From the second IRA ceasefire in 1997 until the first act of decommission of weapons in 2001, almost 50% of the army bases had been vacated or demolished along with surveillance sites and holding centers, while more than 100 cross-border roads were reopened. Eventually in August 2005, it was announced that in response to the Provisional IRA declaration that its campaign was over, and in accordance with the Good Friday Agreement provisions, Operation Banner would end by 1 August 2007. This involved troops based in Northern Ireland reduced to 5,000, and only for training purposes. Security was entirely transferred to the police. The Northern Ireland Resident battalions of the Royal Irish Regiment — which grew out of the Ulster Defence Regiment — were stood down on 1 September 2006. The operation officially ended at midnight on 31 July 2007, making it the longest continuous deployment in the British Army’s history, lasting over 38 years. While the withdrawal of troops was welcomed by the nationalist parties Social Democratic and Labour Party and Sinn Féin, the unionist Democratic Unionist Party and Ulster Unionist Party opposed to the decision, which they regarded as ‘premature’. The main reasons behind their resistance were the continuing activity of republican dissident groups, the loss of security-related jobs for the protestant community and the perception of the British Army presence as an affirmation of the political union with Great Britain. Adam Ingram, the Minister of State for the Armed Forces, has stated that assuming the maintenance of an enabling environment, British Army support to the PSNI after 31 July 2007 was reduced to a residual level, known as Operation Helvetic, providing specialised ordnance disposal and support to the PSNI in circumstances of extreme public disorder as described in Patten recommendations 59 and 66, should this be needed, thus ending the British Army’s emergency operation in Northern Ireland. In July 2007, under the Freedom of Information Act 2000 the Ministry of Defence published Operation Banner: An analysis of military operations in Northern Ireland, which reflected on the Army’s role in the conflict and the strategic and operational lessons drawn from their involvement. The paper divides the IRA activity and tactics in two main periods: The “insurgency” phase (1971–1972), and the “terrorist” phase (1972–1997). The British Army claims to have curbed the IRA insurgency by 1972, after Operation Motorman. The IRA then reemerged as a cell-structured organisation. The report also asserts that the government efforts by the 1980s were aimed to destroy the IRA, rather than negotiate a political solution. One of the findings of the document is the failure of the British Army to tackle the IRA at strategic level and the lack of a single campaign authority and plan.